Fun is something that the young Ocampan, Kes, probably didn't have a lot of during her life prior to joining the crew of the U.S.S. Voyager. But it's something that Jennifer Lien, who played Kes for three seasons on Star Trek: Voyager, has quite definitely been having over the past few years. Over a leisurely lunch in an Italian restaurant in the heart of picturesque Old Town Pasadena, a few miles east of Hollywood, the actress speaks softly but firmly about her life working on the U.S.S. 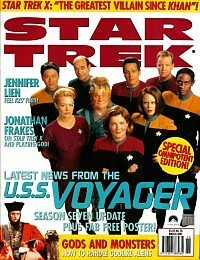 Voyager, and how her horizons have broadened since she parted company with the crew in autumn 1997. She's certainly no longer the childlike and fragile figure who was brought on board the ship in the end of the pilot episode, Caretaker, in 1994, and was initially the youngest member of the cast. Working outside the protected environment of a weekly television show has given the actress a new perspective on life. Jennifer Ann Lien was born in Illinois in August 1974, the youngest of three children. Acting is something she always wanted to do, and luckily she was encouraged by her family. "It was fun," she recalls. "I respected a lot of people in the acting business. I started when I was about 12, and kept on going from there." Lien joined the Illinois Theater Center at the age of 13, where she had roles in several productions, including Miranda in The Tempest and Bianca in Othello. She first appeared in front of the cameras in a dual role, playing twins for an industrial film for Amurol bubble gum. However, her first nig break came when she auditioned for the role of Hannah Moore in the US daytime drama Another World at the age of 16, which was followed by another regular role, as Roanne in the highly successful television series The Phenom. Looking back on those days, Lien can't choose any particular role that gave her a special buzz. "All of them had something that did something for me," she says carefully. "There was nothing that was really important or stood out. I can't really pick out one of them." The role that shot her to stardom, of course, was as Kes on the fourth Star Trek series, Star Trek: Voyager. Lien's mother, Dolores, had been a fan of Star Trek: The Original Series, so Jennifer had grown up with the show around her in reruns. But never imagined that one day she would actually be a member of the cast. Lien was one of the early selections made by the producers, and she recalls the description they gave her when she joined the cast: "Kes left her home planet, having rebelled against the planet's leaders. She doesn't want to stay there any more. She had to go, and decided to join the Voyager crew along with the Neelix character. That was the start of three years of adventures, during which Kes and Neelix became closer, then drew further apart, and the Ocampan became the holographic Doctor's trusted nurse and aide. Did she have any inkling when she started where the producers intended to take the character? "No," she says bluntly. "I found out when I got the scripts." 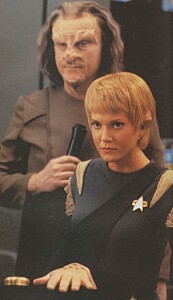 Unlike some of her contemporaries on the show, Lien did not lobby for changes to the way her character was being drawn, nor did she find at time that Kes was acting in a manner that contravened that notion that Lien had of her alter ego. "I thought the writers were during a good job," she points out, "and I felt my contribution was more in the acting, and not in the writing." One thing she is certain about is that she liked the character of Kes, and she thinks carefully before adding, "I don't think I've ever played a character I didn't like." Kes departed Star Trek: Voyager in the second episode of the fourth season, The Gift, and most people believed that this was the last time they would see her. She had entered a higher realm of consciousness after nearly decimating Voyager, and her final act was to push the crew a further 10,000 light years in the right direction towards home - and away from the Borg. However, it seems that everything did not go exactly as the Ocampan had expected, and Kes made a highly dramatic return to ST:VOY in Fury, one of the closing episodes of the sixth season. "The producers wanted me involved in it," Lien explains, "and they wanted to use my appearance to move the story forward." The three years that had passed between The Gift and Fury saw Lien take on a number of other roles maturing both as an actress and as a person. The result of this was that she wasn't so willing simply to accept what the producers had planned for her in the script when they made their approach. "In the beginning, I had them redo the script, or redo part of it," she explains. "I felt uncomfortable with it. I wanted it to go a certain way, and they did respond." The original story for Fury was created by ST:VOY's executive producers, Rick Berman and Brannon Braga, and the final teleplay penned by Bryan Fuller and Michael Taylor. Lien was keen to see some changes in Kes' character - after all, Ocampans only live for nine years, so she had been gone for a third of her lifetime - and certainly Kes' dramatic entrance, crashing her shuttle into the ship, and deliberately causing mayhem and devastation as she heads for the warp core, is very different from anything seen before. At the end of The Gift, Kes departed Voyager because she didn't want to cause any more problems for her friends; in Fury, she's out for revenge for what she believes the crew did to her. No such dramatic motivation affected Lien when she returned to the Paramount Pictures stages for the first time in three years. "It was fine," she comments on her feelings as she worked once more with her old colleagues. "I was great to be in an episode like that. It was nice to see a lot of the people, and catch up. It was a lot of fun." Make-up supremo Michael Westmore has remarked that Lien's old pair of ears still fitted her from her original appearances, and Lien herself laughs as she says, "It wasn't as hard as I'd anticipated. I wasn't in them as long as I'd normally been for the show." By the end of Fury, Kes is more at peace with herself than she started off, closer to the original portrayal of the character. But how much of the spirituality came from Lien herself? Kes is a very caring, loving, down-to-earth, sensible person: would Lien describe herself in that way? "I think the character was very well endowed, but I'm not really," she says slowly. "I think I'm normal, whereas that character has those virtues to a very heightened degree, because she was raised in that sort of culture. I don't think I have those virtues to that height. My emotions are lower." Although Lien says she prefers working in television, "because I liked the schedule", her career path since she left Star Trek: Voyager has taken her more towards movies than the small screen. The work she's done in that time - including American History X, alongside Star Trek: Deep Space Nine's Avery Brooks, and the independent film SLC Punk - has been very varied; did she set out to get as many different experiences as she could? "Well, luckily, I got them, whether I wanted them or not," she laughs. "I was happy because it did vary so much. It was great. There was so much change and it couldn't have been better, really." She recently attended a screening of her most recent independent film, Rubbernecking. "That's still looking for a distributor," she points out, "so if you guys have any idea of anyone...! It's a film about being stuck in Los Angeles traffic. It's funny - it's a humorous film." Humour was also a key part of her involvement with the animated spin-off from the Will Smith/Tommy Lee Jones SF movie, Men in Black, for which she voiced the part of Agent 'L'. "I was there for two seasons," she recalls. Her workload on the show varied from week to week: "It would depend on how much I had to say. It might take an hour to record, it might take two hours. I liked it. I thought it was funny, intelligent, witty and very well done." Voiceover work has continued to keep her busy, with additional stints on comedy series The Critic and Duckman, as well as the more serious adventures of Todd McFarlane's Spawn. Lien tries to keep abreast of what's going on in the entertainment industry. "I'd like to get to the theatre more often," she admits. "I read a lot of plays as opposed to going to them. I don't really go out too much to the theatre. I watch television or go to the movies. I see a lot of films. She is very eclectic in her tastes - she admits to liking every type of music (there's not one she can think of that she's not into). She still plays the trombone, which she started learning in her high school band - although she giggles at the thought that she might be any good at it. She watches comedies or dramas on television with equal ease, and will pick a book of plays of any description. "There isn't a type I don't read," she offers. So has she found any roles during her studies that have really grabbed her and fired her up to play them? "I think in everything there's been some part that I'd like to do," she confesses. Her recent reading has included a compilation of audition pieces, used by actors to demonstrate their range. "What I find most interesting is how political people are," she says. "It's really quite astounding how arts can give you that venue to speak those things." Her theatrical reading, and her early grounding in Shakespeare, have obviously been things that inspire the young actress, as does music. "Art inspires me as well," she adds. "People inspire me. Actors inspire me. Food inspires me!" Which begs the question: with such a wealth of inspiration, would she like to try to share her vision by becoming a director? "I think I need to do acting a little more before I do that," she demurs, but admits that when she's reading a play, she can often see exactly how she would block the action and move the actors on stage. "I think that happens naturally for a lot of people," she says, but does agree that it is a talent that not everybody possesses. What she finds fascinating is watching someone else's interpretation of a scene. "You just wouldn't think of it that way," she says. "I might block it one way, and they might block it an entirely different way." While Lien might claim not to have Kes' spirituality, she obviously cares deeply for others. Asked about what her favourite word is, she ponders for a few moments before saying, "I think 'love' is." She gives her support to charities helping people suffering from AIDS, and she has worked with the US group Camp 40. "I want to be doing what I can for people who need it," she explains. "I'm a big recycle freak. I like to take care of the earth. I recycle paper, bottles, cans, everything." So what does she see herself doing in 10 years' time? "Still working in the acting industry," she replies. "I can't really change the world that much. I want to spend time with people who I care about, meet new people, and do what I like."